When steam alone just won't cut it! 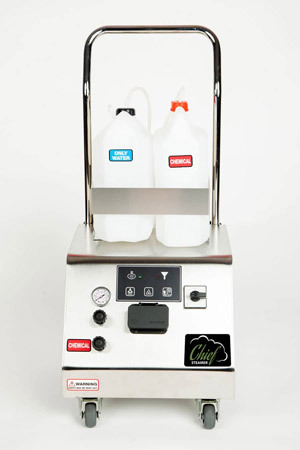 Chief Steamer 125 Injection Steam Cleaner features a unique chemical injection (the cleaner of your choice), as well as steam to clean any interior and exterior surface. 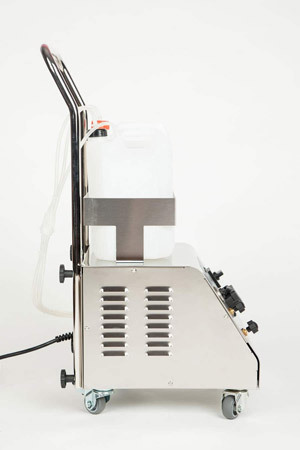 Unlike other injection steamers on the market, the Chief Steamer 125 Injection Steam Cleaner is not diesel or propane powered, and uses 120 volts – making is safe for use both indoors and out. Weighing in at just 45 pounds, the Chief Steamer 125 Injection Steam Cleaner is perfect for both the mobile detailer as well as the DIY enthusiast! Steam cleaners give you the ability to clean delicate surfaces without damage. But what if you could take it further and incorporate your favorite interior or exterior cleaner into the mix? Well the Chief Steamer 125 Injection Steam Cleaner lets you do just that! With two separate "holding jugs", as well as the boiler for steam, Chief Steamer 125 Injection Steam Cleaner allows you to fully customize your detail. Chief Steamer 125 Steam Injection Steam Cleaner's unique chemical insertion bypasses the boiler and uses a pump to inject your cleaning solution directly into the steam hose. With buttons on your handle, you are able to adjust the amount of steam as well as the amount of chemical that is being introduced to the surface. Instead of spraying the surface and scrubbing away with your brush or towel, you can use the Chief Steamer 125 Steam Injection Cleaner and combine those two steps into one! Featuring an upgraded 135 psi rating, the Chief Steamer 125 Injection Steam Cleaner provides more than enough power to clean your entire vehicle, both inside and out! Featuring an external heating coil that will not degrade in the water over time, and a heavy-duty stainless steel body, the Chief Steamer 125 Injection Steam Cleaner is built to handle the rigors of every day use. 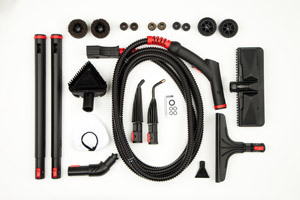 Chief Steamer 125 Injection Steam Cleaner comes with several attachments including 4 large and 6 small round cleaning brushes, two extension pieces, a triangle head brush, two flat head brushes, and micro hose tips for precision detailing. Upgrade your detail and use the power of steam to clean with the Chief Steamer 125 Injection Steam Cleaner! This item ships from the manufacturer via ground service and can only be shipped to the contiguous 48 states. Expedited and international shipping are not available. Due to the size of this machine, a $45 shipping cost will be applied.